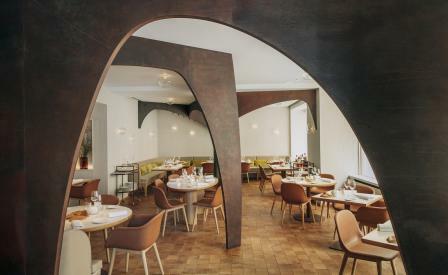 A Parisian favourite for eight years, Nomicos has just emerged from a complete overhaul, courtesy of local designer Marie Deroudilhe. On the walls, glass bubbles designed by Etienne Gillabert hint at the importance of the Mediterranean Sea in the chef’s cuisine. The same goes for the texturised and tinted bay windows, which create a watery feeling and add a natural glow to the incoming light. Produce driven, Nomicos’ cuisine travels south: every plate is a perfect interlude around artichoke or red mullet, bouillabaisse or bagna cauda.